John FITCH (1712 – 1742) was Alex’s 7th great grandfather, one of 256 in this generation of the Miner line. John Fitch was born on 7 Jan 1712 in Lebanon, New London, Connecticut. His parents were Capt. Nathaniel FITCH and Anne ABELL. He married Hannah SCOTT on 5 Nov 1734 in Lebanon, CT. John died on 7 Jan 1742 in Lebanon CT.
Hannah Scott was born about 1721. Her parents were John SCOTT Jr. and Elizabeth WANTON. However, OneWorldTree at Ancestry.com says that her parents were Benjamin Scott, born 1686. and Mary [__?__] born 1689. However, that is the only information about the proposed parents they provide. 2. Hannah Fitch 15 June 1737 Lebanon, CT Nathaniel Winslow? Anne’s husband Elijah Lanphere (Lanfere) was born 23 Aug 1744 Norwich, New London CT. His parents were John Ellis Lamphere (1712 – 1757) and Bethiah Richards (1722 – ). Other sources say he was born in Hopkinton, Kings, Rhode Island and his parents were Joshua Lanphere (1712 – 1784) and Zerviah Ellis (1716 – ). Elijah died 15 Sep 1828 Hamilton, Madison NY. Elijah appears in 1790 & 1800 census in Berkshire Mass. There are many theories on the origin of the Lanphere name, Some say it is of Welsh origin, and is the Anglicization of the Welsh locational name “Llanfair”, but there are few Lanpheres in Wales. There are many variations which makes genealogy a challenge including: Lanfear, Lanfier, Lanfire, Lanfere, Lamphire, Lanphier, Lamphier, Lanfiere, Langfield, Lamphere, Langfear, Lanfyre, Lanfeere, Langfere, Lanfer, Lanfeer, Lampher, Lanfeare, Landfield, Landfear, Lanfeir, Lamfear, Lanfair, Lampheir, Lamfier, Langfer, Lamphir, Lanfilde, Lanfeire, Lanifier, Landfer, Lamphear, Lampheare, Lamfire, Lamfer, Lamfeere, Langfire, Langfell, Landfere, Lanphere, Lanpher, Lanpheare, Langfielde, Lanfyer, Lanfield, Lanfeld, Lanfar, Landfire, Landfier, Landfar, Landfair, Lampyer, Lampier, Lamphyre, Lampfield, Lamper, Lamfeir, Lamfeare, Lansear, Lankfill, Langford, Langfild, Langfeld, Langfaire, Lanfior, Lanfild, Lanfiar, Lanfeur, Lanfaw, Lanfare, and Lanefer. i Fitch Lamphere (Lamphier) b. 30 Mar 1761 Lebanon New London, CT; d. 10 Jan 1826 Durham, Greene, New York; m. 12 Jan 1792 Durham, Middlesex, CT to Jerusha Merwin (b. 27 Aug 1768 Durham). Jerusha’s parents were Miles Merwin Jr. (1744 – 1793) and Mary Parmalee (1747 – 1795) of Durham, CT. Fitch and Jerusha had nine children born between 1793 and 1811. Fitch was a Revolutionary War soldier. Fitch enlisted April 22, 1777, at Lebanon, Connecticut, in Capt. Paul Willis’ company of Col. Samuel Blatchley Webb’s regiment. He served until April 28, 1780, when he was discharged at the expiration of his term of service, at Morristown, N.J. Ref. Pension Claim W27145 (38 pages). Col. Samuel Blachley Webb, commander of Fitch Lamphere’s regiment from 1777 to 1781. S.B. Webb’s Additional Continental Regiment, later became the 9th Connecticut Regiment. Early in 1777, Washington offered command of one of these additional regiments to Samuel Blatchley Webb, who accepted. Webb had formerly served as one of Washington’s personal aides. Webb’s Regiment was allotted to the Connecticut Line on July 24, 1780, and officially designated the 9th Connecticut Regiment. The regiment spent most of 1779 in Rhode Island, but was sent to winter quarters at Morristown, New Jersey. In the spring of 1780, the remnants of Sherburne’s Additional Continental Regiment were merged into the unit, and it was formally added to the Connecticut Line as the 9th Connecticut Regiment. Fitch is found in the 1800 and 1810 Oneida, Madison, NYCensus records of Albany Co., NY, pp. 182 [as Lamphier] and 91 [as Lanpher] respectively. His signed affidavit places him in Catskill, Greene, NY, by June of 1820; the federal census confirms this on p. 141 of the corresponding census where his name appears as Fitch “Lamphier”. Fitch died in 1826 in Durham New York. Durham was first settled around 1782 within Albany County. The town was established from part of the Town of Coxsackie in 1790 as the “Town of Freehold.” In the spring of 1800 Freehold became part of the newly formed Greene County. The town’s name was changed to “Durham” in 1805, the town having been called informally “New Durham” by the many settlers from Connecticut. Part of the town was lost to form, in 1803, the new Towns of Cairo, Greenville, and Windham. In 1836, the western part of Durham became the Town of Conesville in Schoharie County. I have not found his widow or his children in the 1830 census. Jerusha (Merwin) Lanphere signed an affidavit in May of 1839 placing her in Durham, Green Co., NY, and mentions her sister, Olive Smith, living in the same town. Along with the affidavit, Jerusha sent the New Testament title page of the family bible, printed in New York by M. L. & W. A. Davis in 1801. Abstract and copy of bible record printed in The New York Genealogical and Biographical Record, Volume LXXI, 1940, p. 272. In Fitch Lanphere’s 1820 affidavit he states that his daughter “Roda” has been deranged for about 10 years; and that his nine-year-old son, Noah, “has St. Vitises Dance and Cannot Speak.” His son, Jesse, was described as an able bodied boy; and his daughter, Mary, in good health. Sydenham’s chorea or chorea minor (historically referred to as Saint Vitus Dance) is a disease characterized by rapid, uncoordinated jerking movements affecting primarily the face, feet and hands. Sydenham’s chorea results from childhood infection with Group A beta-hemolytic Streptococcus and is reported to occur in 20-30% of patients with acute rheumatic fever. No vaccines are currently available to protect against Streptococcus pyogenes infection, although there has been research into the development of one. Hannah’s husband Nathaniel Winslow was born 22 Apr 1730 in Rochester, Plymouth, Massachusetts. His parents were Deacon John Winslow (1701 – 1755) and Bethiah Andrews. Nathaniel died 6 Jan 1778 in Salisbury, Litchfield, CT.
Nathaniel “fell a victim of a prevailing epidemic, while exerting his powerful influence in aid of the American army during the Revolutionary War”. – Blake’s Biographical Dictionary. According to the history of the Kellogg family in Connecticut, Hannah was the “daughter of Rev. Mr. Fitch of Coventry, CT” and was “instantly killed from a fall while mounting a horse” in Aug. 1806 in Williston, Vermont. It’s possible that the Hannah Fitch who married Nathaniel Winslow was the daughter of Jeremiah Fitch, Jr. and Mercy Porter and was born 13 Sep 1735 in Salisbury, Litchfield, CT instead of 15 June 1737 in Lebanon, CT.
i. Lemuel Winslow b. 1 Apr 1755 in Salisbury, Litchfield, CT; d. Aug 1828 in Williston, Chittenden, Vermont; m. Elizabeth Beach (b. ~1760) Their daughter Betsey was born in 1784 in Salisbury, CT and married Dr. Moses J. Hill. ii. Hannah Winslow b. 14 Feb 1757 in Salisbury, Litchfield, CT; d. 28 May 1802 in Williston, Chittenden, Vermont; m. 1780 Richmond, Berkshire, Mass. to Timothy Tuttle (b. 10 Jun 1755 in Goshen, Litchfield, CT – d. 14 Jun 1814 in Williston, Chittenden, Vermont) Timothy’s parents were Timothy Jonathan Tuttle (1716 – 1760) and Hannah Wadhams (1712 – 1733) Hannah and Timothy had six children born between 1781 and 1792.
iii. Bethia Winslow b. 31 Dec 1759 in Salisbury, Litchfield, CT; d. 2 Jun 1820; m. Samuel Chamberlain (b. 17 Apr 1757 in Westborough, Worcester, Mass – d. 11 Nov 1823 – Massena, St Lawrence, New York) Samuel’s parents were John Chamberlain (1721 – 1805) and Mercy Brown (1724 – ) Bethiah and Samuel had five children between 1784 and 1794 at Richmond, Chittenden, Vermont. European settlement of Vermont did not begin until the Treaty of Paris ended the French and Indian War in 1763. While surrounding townships were being granted by Governor Wentworth of New Hampshire and being settled and organized, there was not one dwelling in the area destined to become Richmond. In 1775, Amos Brownson and John Chamberlain established homesteads in the area known as “the flats” which was at that time a part of the Williston Township. This early settlement coincided with the advent of the American Revolution when Vermont settlements on the borders of civilization were vulnerable to Indian attack. A man and a child were killed at the Chamberlain homestead before Richmond’s settlers, along with nearly all the other families in Chittenden County, abandoned their new homes and fled to the south for safety. After the close of the Revolutionary War, in the spring of 1784, they returned to the farms, on which they had made beginnings, accompanied by Asa and Joel Brownson, Samuel and Joshua Chamberlain, Jas. Holly, Joseph Wilson and Jesse McFairlain. Settlements were built in areas which were then portions of Huntington, Bolton, Jericho and Williston. Portions of these settlements formed what became Richmond. After petitioning the State, Richmond was granted township status Oct 27 1794, and has the distinction of being the first town chartered by the newly formed State of Vermont. By the time the census was taken in 1800, Richmond had grown to a population of 718. Formal community responsibility began with the first Town Meeting in March 1795.The Winooski River and Huntington River both offered locations for water mills. Industries began to manufacture wagons, harnesses, tinware, brass, cabinet work and woodenware. m2. Anna Hannah [__?__] (b 1766 – 14 Feb 1810 Thomas Chittenden Cemetery, Williston, Chittenden, Vermont,) Nathaniel and Anna had three children born between 1789 and 1803, including Hubbard Winslow (1799-1864) who graduated Yale Theological Seminary in 1825 and spent much of his life as a Presbyterian pastor. Hubbard’s most influential works include Are You a Christian?, Intellectual Philosophy, and Moral Philosophy. The Historical Magazine adjudged “in the province of philosophy he had few equals.” Intellectual Philosophy was a popular 19th century textbook wherein he surveys the history of philosophy and, as well, relates influential thinkers to Christian philosophy in an accessible manner. v. Mercy Winslow b. 16 Mar 1763 in Salisbury, Litchfield, CT; d. 1840; m. 1785 to John Devereaux (b. 1756 in Goshen, Litchfield, CT – d. 1843 in Richmond, Chittenden, VT) John’s parents were Jonathan Devereaux (1716 – 1767) and Sarah Seymour (1741 – 1808). Mercy and John had nine children between 1786 and 1797. The Battle of The Cedars was a series of military confrontations early in the Revolutionary War during the Continental Army’s invasion of Quebec that had begun in September 1775. The skirmishes, which involved limited combat, occurred in May 1776 at and around The Cedars, 45 km west of Montreal, Quebec. Continental Army units were opposed by a small number of British troops leading a larger force of Indians (primarily Iroquois), and militia. Brigadier General Benedict Arnold, commanding the American military garrison at Montreal, had placed a detachment of his troops at The Cedars in April 1776, after receiving rumors of British and Indian military preparations to the west of Montreal. The garrison surrendered on May 19 after a confrontation with a combined force of British and Indian troops led by Captain George Forster. American reinforcements on their way to The Cedars were also captured after a brief skirmish on May 20. All of the captives were eventually released after negotiations between Forster and Arnold, who was bringing a sizable force into the area. The terms of the agreement required the Americans to release an equal number of British prisoners. However, the deal was repudiated by the Second Continental Congress, and no British prisoners were freed. Another story is the men were exchanged for British soldiers captured at the St. Jean eight days after their capture. John Devereaux was living in 1780 at Stephentown, NY. John Devereaux appeared on the census of 1790 at Williston, Chittenden, VT.
vi. Lovina Winslow b. 4 May 1765 Salisbury, Litchfield, CT; d. 28 Sep 1832 Thomas Chittenden Cemetery, Williston, Vermont. 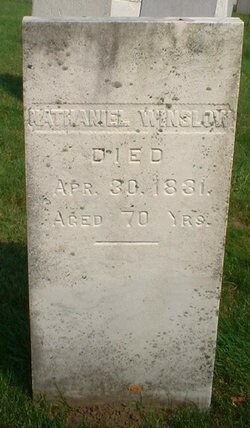 She married May 1788 in Williston, Chittenden, Vermont to Nathan Allen (b. 13 Mar 1760 Litchfield, Litchfield, CT – d. 13 Jan 1834 Thomas Chittenden Cemetery, Williston, Vermont) Nathan’s parents were Elihu Allen and Abigail Dean. vii. John Winslow b. 4 May 1767 in Salisbury, Litchfield, CT; d. 30 Nov 1852 Medina, Medina, Ohio; m. 2 Jan 1787 in Hillsdale, Columbia, New York to Mary Covell (Scoville) (b.25 Aug 1772 in Hillsdale, Columbia, New York – d. 25 Aug 1837 in Medina, Medina, Ohio) Mary’s parents were Zaccheus Covell-Scoville and Mary Wooden. John and Mary had twelve children born between 1794 and 1820 in Williston, Chittenden County, Vermont. viii. Jonathan Winslow b. 7 Jun 1769 in Salisbury, Litchfield Co, CT; d. 5 Oct 1838 in Farmersville, Cattaraugus Co, NY. m. ~ 1792 in Williston, Chittenden Co, Vermont to Mary “Polly” Spoor (b. 24 Mar 1772 Fair Haven, Rutland, Vermont – d. 18 Apr 1848 in Grove City, Jasper, Illinois) Polly’s sister Lydia married Jonathan’s brother Jared. Their parents were Nicholas Spoor (1743 – 1814) and Zilpha Cleveland (1749 – 1816) Her parents were NOT John Spoor and Lydia [__?__]. Jonathan and Polly had five children between 1793 and 1806.
ix. Jared Winslow b. 9 Jun 1771 in Salisbury, Litchfield, CT; d. 2 Nov 1852 in Waukegan, Lake, Illinois m. Lydia Spoor (b. 1769 Fair Haven, Rutland, Vermont – d. 1846, Freedom, Cattaraugus, New York) Lydia’s sister Polly married Jared’s brother Jonathan. Their parents were Nicholas Spoor (1743 – 1814) and Zilpha Cleveland (1749 – 1816) Her parents were NOT John Spoor and Lydia [__?__]. Jared and Lydia had ten children born between 1797 and 1816. In the 1850 census, Ralph and Rhoda were living in Stockholm, Saint Lawrence, New York with the family of Hugh and Olive Allen. One version is Rhoda married Noah Adams (b. 27 Aug 1747 in Pomfret, Windham, CT – d. 26 July 1819 Cavendish, Windsor, Vermont) Noah’s parents were Isaac Adams (1696 – 1757) and Eleanor Fassett (1696 – 1784) Noah first married 22 Nov 1770 Brooklyn Congregational Church, Brooklyn, Windham, CT to Elizabeth Fassett (1749 – 1831) and had five children born between 1773 and 1782. Rhoda and Noah had three children born between 1790 and 1797. There is a question which Noah Adams married Rhoda Winslow and how it relates to Rhoda’s marriage to Ralph Stearns. Maureen Downs writes“Here in Northeatern PA, there are many descendants of Noah Adams (born 1747). I have believed him to be my gggg-grandfather. There is a Noah Adams Family Plot where he is buried in Forkston, Wyoming Co of PA. In the 1940’s, there was a ceremony at the gravesite honoring this Revolutionary War veteran. In fact, there are several local women (long deceased) who gained their membership in the DAR with this Noah Adams as their veteran ancestor. 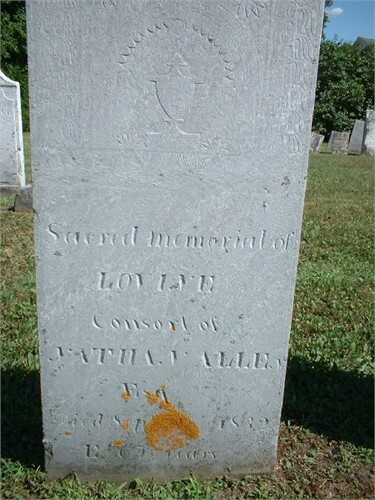 The death date given for Noah Adams was about 1834. Possible but probably questionable. After reading that he indeed moved back to VT and his wife Elizabeth with him and that he died there brought me to ask who really is the Noah Adams who is buried here in PA.
Tryphena’s husband Samuel Minard was born about 1735. Tryphena (Fitch) Minard filed for divorce 17 Aug. 1778 in Colchester against her husband Samuel Minard saying that Samuel had a child (gender not given) with Alice Dodge, a single woman of Colchester. It infers the child was born about Feb. 1778. Who was Alice? Did she and Samuel ever marry? Samuel Minard was not found again after this date. Did he change his name? This entry was posted in -9th Generation, Line - Miner and tagged Lebanon. Bookmark the permalink. On page 128 of The Spoor Family in America by Marie A. Underwood is the usual deceptive account of “John Spoor ‘of New York State’ and Lydia___?___, his wife” and lists Jared Winslow who married Lydia Spoor and had their children listed; along with Jared’s brother Jonathan Spoor who married Polly Spoor, sister to Lydia; and lists their children….and etc., etc., etc…..actually Ms. Underwood listed the proper families of these Spoor sisters on another page in the same book!! If you look at pages 111 and 112, there listed is the family of Nicholas Spoor and his wife, Zilpah Cleveland, parents of Lydia and Polly Spoor, along with all their siblings. Ms. Underwood apparently didn’t put 2 and 2 together & made a big mess of things, as so many genealogists still list the parents of Lydia & Polly Spoor as daughters of John Spoor & Lydia ___?___ ‘of New York State’ as the parents. WRONG!!!!!!!!!!! Ms. Underwood should have known better than that. And Torry E. Winslow listed as son of Jonathan & Polly, should actually be Torry D. Winslow. Hosmer H. Winslow, son of Jared & Lydia, married Torry Winslow’s daughter, Cornelia M. Winslow. So Hosmer married his first cousin once removed. How do I know? Hosmer & Cornelia (Winslow) are my great great grandparents. You can find the book “Spoor Family in America” online and read the actual pages;111, 112, & 128 for yourself. Thanks for the update Blaine, I’ve made the correction. On January 8, 1762 Samuel Minard and Tryphena, his wife, of Lebanon, Connecticut sold an 8+ acre lot located in Lebanon to Elijah Lanphear (preumably Tryphena’s brother-in-law and Anne Fitch’s husband). This land was that distributed to Tryphena by the court as part of the distribution of her father’s (John Fitch’s) estate. Tryphena’s land was contiguous to the lands of Sam’l Law, Azuba Fitch (sister), her mother’s “third”, and Hannah Fitch (sister). This would have been about three years after the marriage of Samuel Minard and Tryphena in Colchester. I am seeking the parents and children for James Minard-Mynard-Miner-Miners and Abigail Camp. On August 28, 1771 a James Mynard (also named Miner on the same document) and Abigail, his wife, late of the town of Milford, now residing in Lebanon, sold land in Milford to Barnabas Baldwin. This land was contiguous to land of Sarah Camp and Deborah Camp. A subsequent sale of Deborah’s land on Feb. 8, 1774 names Sarah Camp and Abigail Camp, wife of James Minard, as her sisters holding lands contiguous to Deborah’s, lands received from their father (first name not given). James and Abigail Minard here mentioned in Milford land records are believed to be the same couple subsequently living in Ulster County, New York by 1789 with a number of other Minard families, some of whom were likely their children.